The Maroon Clownfish, Premnas biaculeatus, is one of the most popular and iconic reef tank fish. They are one of the top 20 most popular saltwater fish species because of their awesome maroon red coloration and 3 white or gold stripes. There is also a few “designer” variety of this fish available from ORA Farms called Lightning Maroon or Gold Flake. As far as clownfishes go, P. biaculeatus can get pretty large, growing up to about 6 inches, in length, with the female clownfish being much larger and more aggressive than the male. MC’s tend to live about 5-7 years, on average. Keep in mind that your individual fish may not live an average life—it could die much older or younger—5-7 years is just a rough estimate. These are hardy fish and are tolerant moderate changes in water chemistry and parameters. Try, though, to keep water in stable conditions in order to provide the best and most healthy environment for your tank inhabitants. As for the tank size, a single Maroon Clownfish requires at least 30-gallons of living space. It is best to keep a pair of fish in a tank that is 55-gallons, or larger. Regardless of the size of your aquarium, once you add 1-2 maroon clownfishes, they will consider the entire tank to be THEIR TERRITORY–and they will defend it! If you’re planning to keep a pair —be sure to give them a lot of space and ample hiding places within the live rock to allow the male to escape the aggression of the female fish that is much larger than he, or you might just end up with one lonely female. Maroon Clownfish are quite easy to feed because they are not picky fish. In the wild, they would mainly eat zooplankton they would find in the ocean. 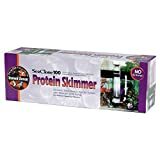 In the home aquarium, they will eat just about anything you feed them—flakes, pellets, mysis shrimp, brine shrimp, black worms. 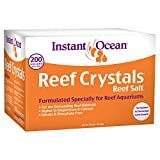 I generally recommend that you try to feed your fish 2-3 times a day, if possible, although it is certainly possible to keep them relatively healthy with a single, sufficiently sized feeding, if life gets in the way. 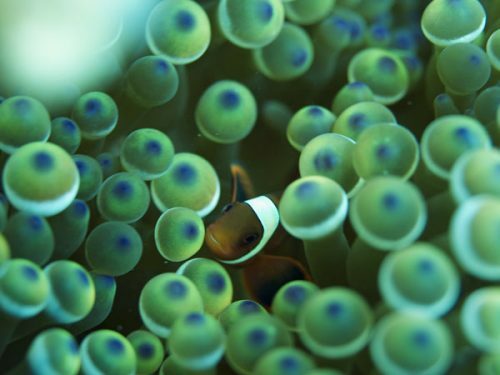 Maroons are one of the most aggressive and territorial species of Clownfish. They are notoriously territorial and should be the last fishes you add to the tank, if possible. By placing these fishes last, you make them lowest in the pecking order, in terms of establishing a territory. In that way, the fish acclimate to your tank and learn their place, with established fish in the tank defending their own territories. If, on the other hand, you placed the Maroon Clownfish first, they would likely define the majority of the tank as ‘their territory’ and would aggressively defend their territory against any foreign ‘invaders’, whether it is the next fish you add or your hand…when performing routine maintenance. Many new aquarium owners get their first tank because they imagine themselves with a clownfish pair, swimming in an anemone, but the problem with that ideal vision is that most anemones grow slowly in the open ocean, are wild-caught and have a terrible track record of success in the hobby (although I haven’t seen any specific, reputable, recent reports about that). If you do have your heart set on an anemone for your clownfish, check out the Bubble Tip anemone (Entacmaea quadricolor), because they do relatively well in captivity and are even fragged by many aquarists, once they get large enough. 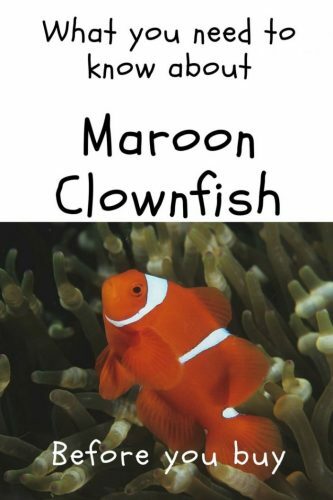 They are also one of a few species that naturally host in maroon clownfishes the wild. However, please note that your clownfish do not need an anemone to be happy and healthy in your tank. 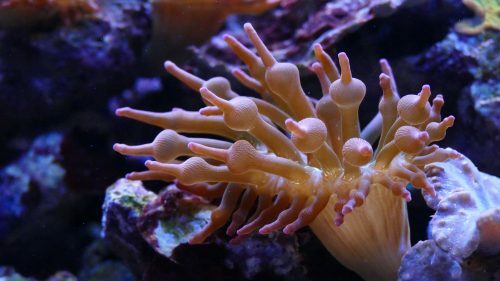 In fact, most people do not have an anemone in their tanks. If you plan on keeping a pair of these fish in your tank, the traditional advice (check out Wilkerson’s book), is to attempt to pair up a large fish with a small fish. Clownfishes are protandrous hermaphrodites, which is a fancy, technical term that explains that they can change gender, in one direction. They all start out as males, but can change gender to become female. The female is the larger and more dominant of the two. If you introduce two similarly-sized juvenile males, you run the risk that the two fight to the death, or significant detriment of the other. If, however, you introduce a large and small fish, the lopsided battle for dominance will more likely be won swiftly and with less damage to the losing male. 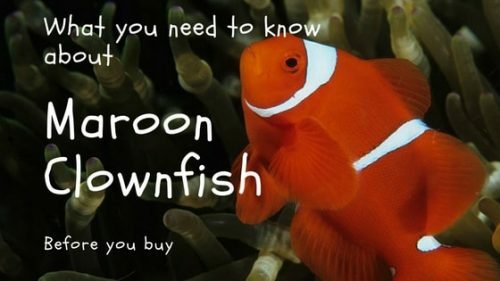 If you can establish a pair, without losing the male, and if you can provide them with enough space, Maroon Clownfish are said to be moderately easy to breed. The eggs and larvae are large, relative to most other saltwater fish, so they are on the easier end of the spectrum, in terms of ease of feeding after hatching. The eggs are tended to by the parents, much like a freshwater cichlid would. The eggs hatch in about a week, and a healthy, well-fed pair will spawn on a relatively routine interval (about 4-6 weeks, although individual pairs will establish their own pattern. Courtship takes place about 3 to 5 days before actually spawning. As they begin their courting ritual, they would they would clean a rocky area near the anemone, to provide an adequate place for the eggs to adhere to. They display an intricate courting dance, including leaning towards each other, touching various parts of their bodies, or head shaking.